For me, Charm bracelets have always been a bit of a hit or miss but recently I’ve been loving wearing my jewellery on my arm. You don’t need something massive and out there (unless that your style) but even just something sophisticated and understated can still make a big statement. There are some stunning charm bracelet styles out there at the minute, such as the collections from ChloBo. If you’re looking for something a bit quirky, their Love Revolution collection could be right up your street; think flower power, smoky quartz and peace signs and you’re pretty much there. If you’re looking for something classic and elegant to complete your beach look on the other hand, then their new Luna Soul collection is one you should take a look at. Try mixing their griege Labradorite bracelets with the peach sparkle of the Aventurine gem bracelets. There are a few pieces that never go out of style, oozing that 1950s glamour and all you need to do is think big. 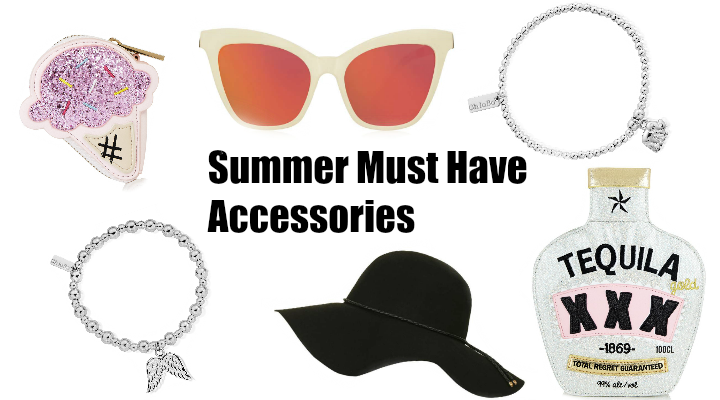 Over-sized is in at the moment, and if you pair an over-sized sunhat with a pair of large-rimmed white sunglasses, you’re already on your way to being that summer fashionista. I always like to add a bomber jacket or a cover up or something over the top too, just something light to throw on; if you’re staying in this country for the season, then you can easily buy something a little thicker and wrap it up when the sun goes away. When you’re lying on an exotic beach however, a light wrap or coverup should keep the sun (and sunburn) off your shoulders during the day – and God knows I need this! I hope you enjoyed this post on my summer must-haves. Do you have any accessories that you can’t do without on holiday? Be sure to leave me a comment and let me know. Previous Post So you want to go to Disney World? 5 Things to think about before booking your trip!